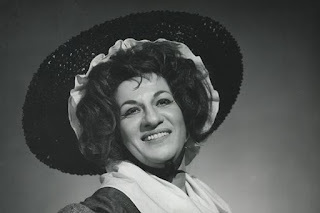 Lili Chookasian was one of the world's leading contraltos during the 1960s and 1970s with a long and celebrated career at the Metropolitan Opera. She was born in Chicago on August 1, 1921, the youngest of three children to immigrants from Sepastia. Her family was a survivor of the Armenian Genocide. Her first language was Armenian, and she would acquire her English proficiency after attending school. After high school, Chookasian began studying singing seriously, and earning money singing in the choirs of Armenian churches and on the radio. She began performing professionally as an oratorio and concert singer in the 1940s, mostly in Chicago but also occasionally out of town. The main highlight of her early concert career was her performance as soloist for Mahler's second symphony with the Chicago Symphony Orchestra, directed by Bruno Walter. In 1956 Chookasian was diagnosed with breast cancer, and her physicians gave her six months to live. She underwent a radical mastectomy, which was further complicated by a widespread infection that required additional surgeries. However, she fought her way back to health. She would have another breast cancer scare in 1961, which forced her to another mastectomy. At the age of thirty-eight, in 1959, Chookasian made her first opera appearance and a resounding success as Adalgisa in Vincenzo Bellini’s Norma with the Arkansas State Opera. In 1961 she was hired for a concert performance of Sergei Prokofiev’s Alexander Nevsky with the New York Philharmonic. Shortly thereafter, she was offered a contract with the Metropolitan Opera but turned it down because of family considerations. After successful performances in Italy and Baltimore, she finally accepted a second offer to join the roster at the Metropolitan, where she debuted in March 1962 in Amilcare Ponchielli’s La Gioconda. During her 24-year-long career at the Met, Lili Chookasian sang many principal contralto roles and a number of secondary parts in operas by Giuseppe Verdi, Richard Wagner, Claude Debussy, Gounod, Mussorgsky, and many others. While working at the Met, Chookasian quickly became one of the leading contraltos performing on the international stage during the 1960s and 1970s, singing under the best conductors of that time, like Leopold Stokowski, Leonard Bernstein, Herbert von Karajan, and many others. She was particularly admired worldwide for her performances in Beethoven’s ninth symphony, Gustav Mahler’s symphony Das Lied von der Erde (The Song of the Earth), and above all Giuseppe Verdi's Requiem. In September 1967 she traveled to Armenia, where she performed in two productions mounted in her honor at the Alexander Spentiarian Opera Theatre: Amneris in Verdi’s Aida and Parandzem in Dikran Tchouhadjian’s Arshak II. She received the prize Bedros Atamian of the Ministry of Culture of Soviet Armenia in 1981. During a performance of Kurt Weill’s Rise and Fall of the City of Mahagonny in 1984, she suffered a minor heart attack on stage and was unable to continue. Her career slowed down and she performed for the last time at the Met on February 17, 1986 in Charles Gounod Romeo and Juliet, which became her farewell to the opera stage. After retiring, Chookasian joined the voice faculty at Yale University’s School of Music. She taught there and resided in Branford, Connecticut. In 1987 she lost George Gavejian, her husband of forty-six years, with whom she had three children. In 2002 she was awarded Yale’s Sanford Medal. She was name Professor Emeritus of the School of Music in 2010. Lili Chookasian passed away at her home in Branford on April 10, 2012.